During its heyday from the first to third centuries CE, the ancient city of Palmyra flourished as a crossroads of Eastern and Western people, goods, and cultures. The unique blend of Eastern and Western influence on Palmyrene society remains visible in the elaborate funerary relief portraits carved to commemorate loved ones. In this episode, we tour an exhibition of Palmyrene funerary portraiture, on loan from the Ny Carlsberg Glyptotek in Copenhagen and Stanford University, with curator of antiquities Ken Lapatin and Getty guest scholar Rubina Raja, who is professor of classical archaeology at Aarhus University, Denmark. KENNETH LAPATIN: There is this mixing of Eastern and Western that’s neither Eastern nor Western, but is distinctively Palmyran, made locally for their own use, but drawing on different traditions. CUNO: The ancient city of Palmyra, on the edge of a desert in the modern state of Syria, reminds us of the extent of the Roman Empire and the role of this great city in the network of international trade linking Asia with Europe more than two thousand years ago. 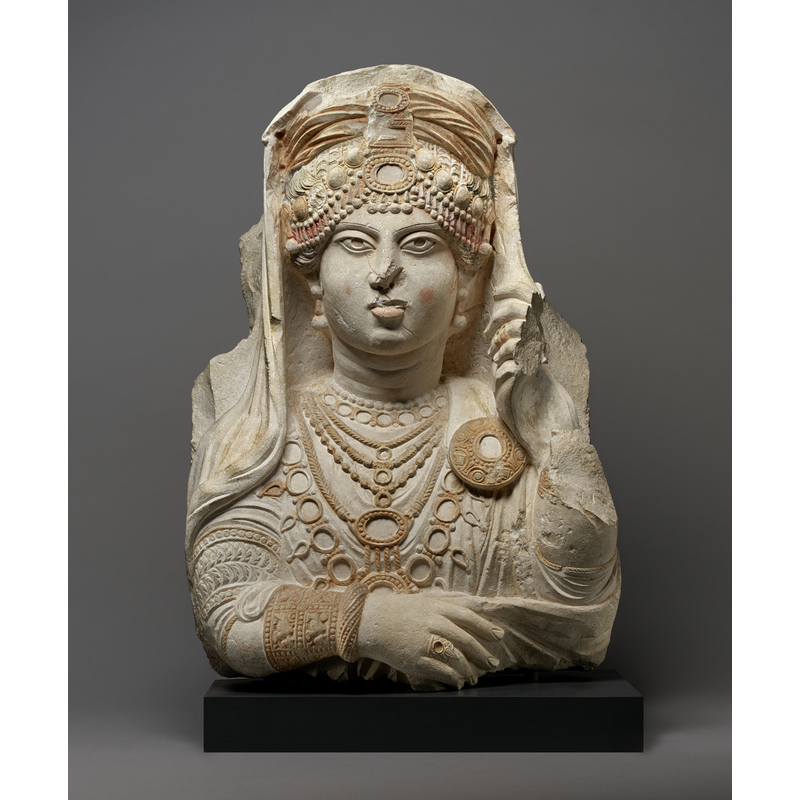 The Getty Villa recently mounted an exhibition of Roman-era sculpture from Palmyra. I visited the gallery with its curator, Ken Lapatin, and the visiting scholar and head of the Palmyra Portrait Project, Rubina Raja. For almost two thousand years, Palmyra’s physical remains stood as proud beacons of an earlier time. Then, suddenly, with the outbreak of the current Syrian Civil War, much of the ancient city was damaged or destroyed. 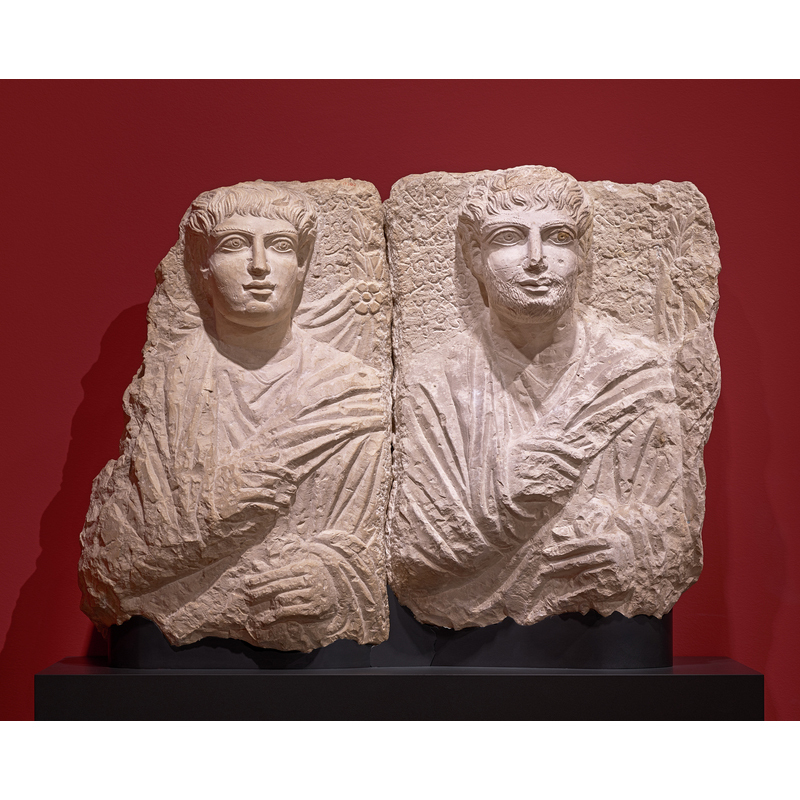 In this episode, I speak with Ken Lapatin, Getty curator of antiquities, and Rubina Raja, Getty guest scholar and professor of classical archaeology at Aarhus University, Denmark, about Palmyra: Loss and Remembrance, an exhibition of Palmyrene funerary sculpture on view at the Getty Villa through May 2019. We met in the exhibition gallery. Rubina and Ken, thanks so much for joining me this morning on this podcast. And before we talk about the exhibition itself, let’s talk about Palmyra, an ancient city much in the news recently for having fallen victim to the political and religious violence of the Syrian civil war. Ken, if you could, please describe for us the physical and cultural conditions of ancient Palmyra, what the French archaeologist and historian Paul Veyne calls an ancient merchant republic. LAPATIN: Palmyra, though in the center of the Syrian Desert, was blessed by being at an oasis site. And the site was occupied for thousands of years before the city flourished. CUNO: For thousands of years? LAPATIN: For thousands of years. It’s even mentioned in the Bible, as a foundation of Solomon, although it existed long before that. But it really reached its heyday during the early years of our era, when, as a key node in what we think of as the Silk Roads, a transfer point from camel caravans going across the desert to bring luxury goods such as silks, gems, spices, to the Mediterranean world by mules, Palmyran merchants gained vast wealth and then built incredible ceremonial architecture—colonnaded streets, arches, temples—that in some ways, look very Classical, but in other ways, are particularly Eastern. CUNO: When you say oasis town, it probably gives the general public the impression that there are a few palm trees and a little bit of water. But this was a rather massive oasis, right? RUBINA RAJA: Well, yes, it was a large oasis. It’s even quite large today still, but much smaller than it was in antiquity. And the desert is not a desert as we know from the Sahara, for example; not a sand desert, but a steppe desert. So they could actually have stock grazing there parts of the year. And we know that the irrigation systems, for example, were extensive in the region. So we don’t have to imagine that it was completely barren all year around, around the oasis either, but much more water was present then than today, for example. CUNO: Was it a kind of transfer point, so that camel and mules bringing goods from the Tigris and Euphrates and Red Sea, for example, then would transfer to transportation that would take it up to the Mediterranean? RAJA: It was definitely a point of transfer. And we even know from the text [inaudible], from the second century CE, that there had been problems with caravan leaders fighting about how much it would cost to reload a camel load onto the mules. And this was one of the reasons that these price edicts were put up in Palmyra, giving us exact information about how much it cost to reload camel loads to mules, to go on to the Mediterranean coast. LAPATIN: One of the things that I think is fascinating, also, is we think about Palmyra in the desert. And it’s often called, by moderns, the pearl of the desert. And pearls were one of the great commodities traded in Palmyra, because they were found in the Red Sea. And we have good evidence for Palmyrans operating also on ships and commanding nautical routes. And their reach was very large. We know of Palmyran soldiers in the Roman army in Britain. So Palmyran networks, social and mercantile, were very widespread, although today, the site seems to us to be very remote. CUNO: Hm. Give us a sense of the scale of the city. And we know that it was linked to Petra and linked to Alexandria, for the point of reaching the Mediterranean Sea, for example. Are they similar in size and scale? And how did it compare to Rome in size and scale? RAJA: Well, Palmyra was a large city, but it wasn’t a metropolis. In antiquity, we have very few metropolis, like well, Rome, Alexandria, Antioch being the three largest ones. Palmyra was more than middle-sized, but we don’t know the exact size of the town because it’s only the central monuments that have been investigated and studied until now. But the main street running through Palmyra from one end to the other is more than one kilometer long. And the largest sanctuary, the Sanctuary of Bel, placed at one end of the city, has a terminus that’s more than 500 by 500 meters. So it’s large monuments, it’s a large city. We know that over these 300 years which we can term the heydays of Palmyra, there’re more than 500 massive monumental tombs. CUNO: Mm-hm. And there was a sort of religious center and a commercial center. They weren’t the same center, I suppose. But if you give us a sense of the character of the layout of the city. RAJA: Well, what we know archaeologically about the city really stems from the first three centuries CE. And there, the city developed around the main axis, central colonnaded street of the city. Around that, the theaters, the other temples. So the tribal center, so to say—Palmyra was a tribally-based society—were located: the agora—so the market where people would actually trade—and the domestic houses. The tombs were usually located around the city, but very rich tombs, very important tombs, could be located within the cityscape. So we have house tombs and temple tombs, which would be actually located on the main or the side streets. So it would have been a very lavish urban environment, which really drew on architectural, cultural traditions from both East and West. And that’s what we see reflected in the way that the columns are combined. I mean, with Corinthian capitals, but with these consoles upon which statues could be placed, also. CUNO: We’re standing next to a great photomural on the wall of the exhibition gallery that shows a part of this ancient metropolis or an ancient city of Palmyra. Ken, describe it to us, for us. LAPATIN: Well, we’re looking at the great colonnade that runs through the city, which Rubina described. The street that ran for more than a mile, which was lined with massive columns cut from the local limestone, not marble. Bringing marble from the Mediterranean to the Syrian Desert was very expensive, and was done for just a few important statues. But there was a very good local source for limestone. And so massive columns were erected to create long porticos with ceremonial arches at important nodes, and then important buildings like the great temples, the theater, were erected alongside this street. And this was known for hundreds of years in the West, since its rediscovery. And in the exhibition, and also in the exhibition online, we have amazing engravings by early travelers to the site, who, quote/unquote, “rediscovered” the site, although locals had known it all along; it hadn’t been lost. But through these detailed engravings of not only the architecture itself—the temples, the colonnades, the arches—but of the individual elements—the leafy capitals, the floral moldings—Palmyra had a great import on Neo-Classicism in the West. And in fact, it’s been pretty well suggested that one of the Palmyran reliefs of an eagle inspired the eagle of the symbol of the United States that had been recorded in the eighteenth century. CUNO: Well, describe to us some features of the architecture, because one can see the influence of the East or the meeting of the East and West. So this isn’t simply with reference to ancient Rome, but there’s a reference to a kind of Eastern or Persian influence in the architecture. LAPATIN: I think the hybridity is best viewed if we look at the temples themselves, which are superficially, and from the exterior, appear to be like Greco-Roman temples. They have colonnades on all four sides, they have individual elements taken from the Classical vocabulary, like the Corinthian capitals; but they have significant differences, because the ritual that took place in Palmyra, the pantheon of gods was somewhat different. So instead of entering through the short ends of the temples, as one did in the Greek and Roman tradition, there were great doors in the sides of the temples. There were also stairways to lead to the rooftop, where there were altars, fire altars, to worship the gods. So there is this mixing of Eastern and Western that’s neither Eastern nor Western, but is distinctively Palmyran, made locally for their own use, but drawing on different traditions. And we see that same combination of elements for local consumption in smaller versions in the funerary reliefs on display here. CUNO: And these four big columns that we are looking at here, there are the typical acanthus leaves capitals, but then there’s something on top of the acanthus leaves capitals. What are those? RAJA: Yeah. Well, they’re very interesting. They are sort of cushion-like. I mean, of course, made in the local limestone, but cushion-like, extra small capitals put into carry architraves even higher up. So they’re basically additions. Just like the statue consoles that are sort of shoved into the middle of these columns, these cushion-decorated stone bases or capitals, they are simply extra pieces put in to make the columns even higher. CUNO: Yeah. They’re decorative. Should we identify something in them, like they look like cushions or like woven baskets or some reference? RAJA: …of Palmyra and the oasis. CUNO: Well, we’ve introduced this concept of hybridity of East and West meeting in Palmyra. We know from the sculptures that we are surrounded by in this room itself, that the costume of the Palmyrans was different, that they were sewn and not draped, as they may have been draped in Rome, for example. The men wore wide trousers, like those the Persians wore, and the women wore turbans and even more voluminous pantaloons, and they had rings of jewelry all about their necks. What about the culture of Palmyra? RAJA: Well, it’s a large question, because we don’t know very much about Palmyran society before the turn of the first millennium. So it seems to sort of raise out of the desert sand with the rise in trade connections. And from then on, it really becomes quite clear that it’s very distinct Palmyran. It’s not what people sometimes term a melting pot; it’s much more a distinctive set of choices to shape a very local, rich society’s identity. What we of course need to keep in mind is that it’s not your ordinary Palmyran person you see depicted in the public sphere, or who actually sponsored the monuments. It was the Palmyran elite. And there seems to have been a large percentage of those in this society, as well. LAPATIN: I think it’s also important to recognize that the works of art, they’re not photographic. They’re normative and they’re presenting idealized versions of Palmyrans. So we’re seeing them, as Rubina says, making choices as to how to present themselves, largely to each other, but also to some degree, to outsiders. But the tombs were enclosed. But they had the choice of dressing in the voluminous drapery, the pantaloons, or things more akin to Greek and Roman dress, the himation and the toga. And it’s this hybridity we see in the reliefs. Some of the reliefs, we have people wearing clothing that seems to be following Roman models, and the gestures follow Roman models. But they might have haircuts and beards that follow Persian models. So these people are wearing different identities, very much as people do today, reflecting their heritage and depending on the context in which they’re presenting themselves. In the Palmyrans, there’s a limited vocabulary. So at first glance, these reliefs might all look the same, or look very similar. But once we stop and look very closely, we can see a lot of subtle differences that are specific choices as to drapery, jewelry, headgear, gesture. And then of course, there are the inscriptions in Palmyran Aramaic, the local language, that tell us more about these people, that really concentrate on their family connections. Which makes sense, if you think of the funerary context. CUNO: Yeah, we’ll get to that in a minute. What do we know about the food culture of Palmyra? 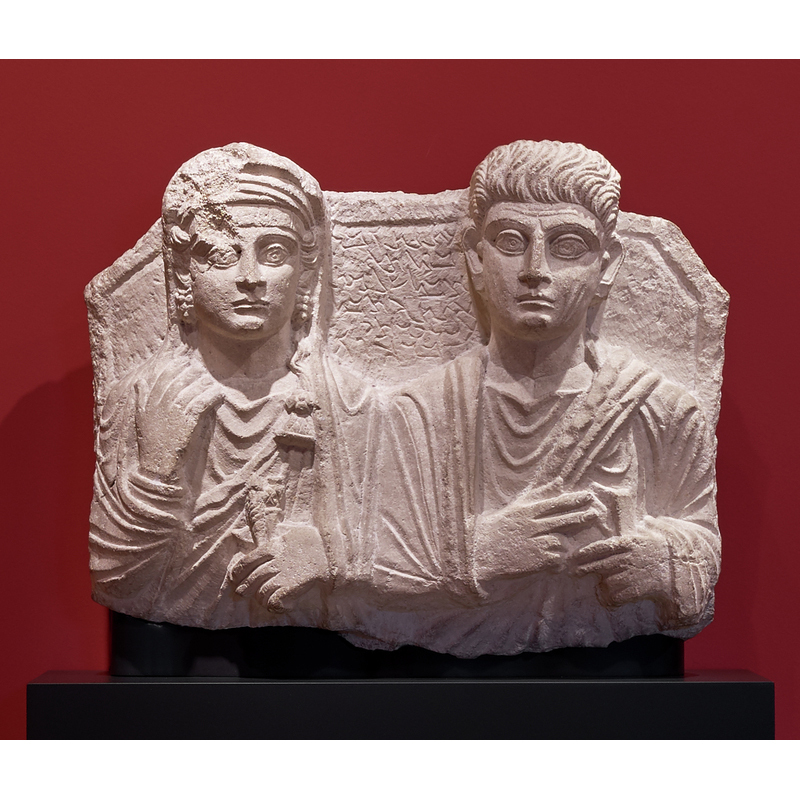 What do we know about the artistic culture of Palmyra? What are the intangible cultural aspects of Palmyra? RAJA: Yeah. Well, the food culture is very well represented in the funerary sphere. It would, of course, in antiquity, have been well represented on the main streets, as well, and the side streets of Palmyra. But what we have left is the banqueting reliefs from the funerary sphere, which are very rich reliefs showing us family feasts. So men holding drinking cups in metal, very nicely decorated. CUNO: Looking like Roman cups or looking like Persian cups? [Raja: Well—] What about that transfer of culture of East and West? RAJA: I just hosted a conference on attributes in Palmyrene funerary sphere, and we had someone, an America professor, Maura Heyne, present on the drinking bowls. And the interesting thing is, there are even choices going on here. There’re very distinct Roman and Greek cups, the so-called skyphoi; but then there are also Parthian drinking cups. And there are even nicely blended examples of drinking cups that are actually drawing on both traditions also. And then there’s a long string of fruit of vegetables and breads and cakes, so on and so forth, also represented in these banqueting reliefs. So that really goes to show how central, of course, that was to family life and to making a great party, as well. CUNO: Yeah. Ken mentioned Aramaic, the language of Palmyra. Talk to us about that, how important it was that it had this particular language, and how we know about this language and its use in the culture of Palmyra, both as inscriptions on the funerary context, but were there texts that have survived? RAJA: We have several thousands of inscriptions from Palmyra in the very distinct Palmyran-Aramaic dialect. Most of them, again, come from the funerary sphere. We have more than 1,300 inscriptions from the funerary sphere. And they are, in the funerary sphere, almost exclusively in the local dialect. But in the public sphere, the picture was quite different in antiquity, because Palmyra can also be said to have been the only truly bilingual city in the East in antiquity. So you would, on the main street, encounter inscriptions in Palmyran-Aramaic, with a Greek translation underneath, in order to show that this was actually a multicultural society, and a society that placed itself firmly within a Greco-Roman world, as well. So again, a very clear choice: in the public sphere, double language or bilinguality very present; and in the funerary sphere, exclusively the local Palmyran-Aramaic dialect. We do not have papyri from Palmyra, we do not have texts on other material than the local limestone. But that includes all these thousands of inscriptions, and it also includes, for example, the very famous text serif[?] from the second century CE, which gives us the pricing on a lot of commodities coming through the city. LAPATIN: And if I’m not mistaken, we have just a few Latin inscriptions. But most of the Romans there would’ve been Greek speakers, because Greek was a kind of lingua franca in this period, especially in the Eastern empire. CUNO: Right. Well, Rubina, you refer to the Aramaic as a particular dialect of Aramaic spoken at Palmyra. How extensive was Aramaic generally? And what other dialects were there in the region? RAJA: Well, Aramaic was, of course, the other lingua franca of the region, and what was used widely throughout the region, as well. So I mean, Semitic dialects was the everyday language of the complete region, from Northern Syria to the south, I mean, down throughout Petra, also. I mean, in the whole modern day Jordan, as well, we have Semitic dialects. 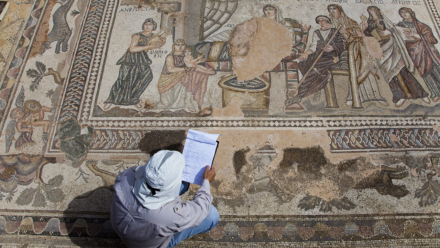 A new fantastic grave in Beit Ras in Jordan has been found and investigated. And there, interestingly, Aramaic is translated into Greek. So Aramaic words are simply written with Greek letters. So that’s another way of showing cultural blend. But the Aramaic dialects were the lingua franca of the region in antiquity. CUNO: Oh. Now, we’ve mentioned once the religious culture and practices of Palmyra. Tell us more about that. And particularly about the god Bel. RAJA: Well, there’s a lot we know about the religious life in Palmyra. We know it was polytheistic, like all other societies at that point in time, also. We know about the three main gods of Palmyra, Bel, Yarhibol, and Aglibol, who are all worshipped in the temple of Bel in Palmyra, as well. CUNO: Where else would they have been worshipped? That is, beyond Palmyra. RAJA: Well, they were worshipped in different contexts also throughout the broader region; for example, at Dura-Europos, on the Euphrates. And Bel was a main god in the region, as well. But every society would sort of adapt their own sort of god to fit the city’s identity, as well. So the Bel of Palmyra would look slightly different than the Bel of Dura-Europos, for example. CUNO: You mean in the practice of the religious veneration of Bel or—? AJA: Well, more in the iconographic tradition, for example. One problem we have is that we actually don’t know too much about which rituals were practiced. But we do know that religious banquets was a big thing in Palmyra. So large banquets were hosted by priestly societies or by individual priests, in these banqueting halls. We know that small ancient tickets were made in clay, giving us even names of the priest hosing the banquet, or sometimes even the date of the banquet. Sometimes even how much food people were allowed to have when they had one of these ancient tickets. So these small tesserae are really one way into understanding that religious practice at Palmyra was really very much about social connectivity among the elite themselves; but probably also in order to include the rest of society, so invite them into these public free banquets. And you could feel specially chosen if you were invited into the sanctuary when one of these took place. LAPATIN: And of course, such banquets contributed to raising the status of the person who gave them. And we see these events and this status commemorated a lot in the reliefs. Banquet reliefs are a special category of the funeral reliefs, and that’s one of the choices that could be made by the deceased or the deceased’s family, to raise the status of the individual and the family, and commemorate that after death. CUNO: This idea of funerary banquets and the importance of it in the cultural practice and religious practices of Palmyra, how does that relate to such practices in Rome or in the East? On the continuum that we’ve been trying to sort of describe that links East and West, how does this practice in Palmyra fall on that continuum? RAJA: Yeah. There was a broad tradition in the Mediterranean for the so-called tot mal[sp? ], so the meal given to the dead people. And we also know, I mean, in the broader Mediterranean region, and not least Rome also, that on an annual basis, you would commemorate through banqueting, deceased. But the interesting thing about the banqueting reliefs in the Palmyrene funerary sphere is really that they are not funerary banquets. They are banquets held in life. These are happy families showing off their wealth while they’re alive. So that doesn’t mean that we didn’t have funerary banquets in Palmyra. We know we had that. But they’re just not depicted. So banqueting as such was really a central feature, both in connection with funerals and commemoration of the deceased, but also in general, exactly to sort of underline wealth and continuity of family traditions. And that’s a broader Mediterranean trend. LAPATIN: It’s interesting. Later this year, on Halloween, we will open here at the Getty Villa, an exhibition on the underworld in the Greek and Roman tradition, about the afterlife. And the Palmyran tradition, the funerary art, isn’t prospective. It’s not about what happens beyond. It’s not about the life beyond. It’s more commemorative. It’s celebrating the life of the individuals, presenting the individuals very vividly in their finest clothes, wearing their jewelry. Sometimes—rarely—with reference to their professions, always with reference to their families. So they’re made present, even though they’re dead. So it’s, again, a— I wouldn’t say it’s retrospective, either. It’s really of— at the moment. And it’s a continuum and it’s making them last, and it’s commemorative in that way. CUNO: What about the political structure of Palmyra, and how did it relate to the greater Roman world, the Greco-Roman world? RAJA: Well, we know that in the first century CE, Palmyra was structured around twelve tribes, or twelve families, so to say. We also know that these were restructured in the second century and sort of merged into four families. And we have no idea how that actually worked or whether this was a Roman political imposition on Palmyrene societal structure, or whether it was actually a restructuring of Palmyrene society that the elite actually took action on themselves. What we do know is that Palmyra seemed to have worked quite differently from, like, the normal Roman way of doing things, exactly because it was a tribal society. So we see that, for example, very clearly in the religious life, as well. Priesthoods were not structured, like they were in Rome, for example. They were closely connected to the elite families, as well. They could be sort of passed on to sons and nephews and so on and so forth. It’s very interesting to note that approximately 20% of the funerary representations of the male representations are Palmyrene priests. That’s very significant. I mean, that equals that every fifth man you would meet on the street would actually act as a priest. But that’s because priesthood was something that you could practice at certain points a year, because you were important. You wouldn’t actively be a priest all of the year, for example. And that sort of is reflected in the political structure, as well, which is tightly, closely knitted together with the family structures and the important family fathers, also. CUNO: I read somewhere that in 251 of the Common Era, so in the middle of the third century of the Common Era, Palmyra became a vassal state of Rome. What triggered that change of status, and what did that status represent? RAJA: Well, one can sort of trail back and say already in the sixties, before the Common Era, the whole region became part of the Roman Empire. So when Pompey the Great campaigned through Syria, these regions became part of the Roman Empire. So in 251, Palmyra had already been part of the Roman Empire for more than 300 years. What changed was really that it became a colony. It got the status of being a Roman colony at this point in time. And that gave it some advantages tax-wise, for example. And that was, of course, very fortunate for a trading city like Palmyra. And that in turn, also led to the problems, because when the Roman emperor wanted to change this deal with the taxes, the problems of the later third century really began, and that became the beginning to the downfall of the city, which was sacked in the late third century. CUNO: What about the great late leaders of Palmyra, Odaenathus and his wife Zenobia. Tell us about those last two reigns of leaders. RAJA: Yeah. They are sort of— Well, one can say commas in the long history of Palmyra; but they have, to us, become the absolute central points because, well, basically, the life of Palmyra, as we know it in its heyday, stops in 273 CE, when the Emperor Aurelian takes Palmyra as a consequence of all the problems he’s had with Odaenathus and later, Zenobia, who takes over. Royal families, it’s difficult really to tell what that means. We’re not talking about Etruscan kings. We’re not talking about royal families that had existed for centuries, but it’s much more, again, strong elite families who grab power, and who are allowed by the other elite families to take power, because they really were the ones that were good at navigating in this complex, not only Roman political system, but not to forget to the Parthian system on the other side. And Palmyra was right in between, so you really had to have great political skills to navigate that. LAPATIN: I think that’s really important to remember, that from the beginning, although from the first century, Palmyra comes into deep contact with Rome, with Pompey’s conquest and the expansion of the Roman Empire. And we see, kind of almost out of nowhere, the beginning of the sculptural tradition, what archaeologists have come to call the sculptural habit. And the typology of these funerary reliefs is very clearly drawn on Roman reliefs. And it’s very easy to see the influence of Rome on Palmyra. It’s on the very border of the empire. It’s at the edge of the desert, and it’s an outpost that the Romans have political control; but culturally and economically, the Palmyrans have, you know, a foot very firmly planted much further East. They’re a border town. And being a border town, they’re looking in all directions and they’re borrowing from all sides. And as their wealth grows and as they have these problems with the Romans, I think Odaenathus and then Zenobia, seeing weakness at Rome, think maybe they can break free and assert greater independence. And they’re able to do this briefly, and then it all goes bad and the Romans come and sack the city, ultimately. CUNO: And within, like, only seven or eight decades, the empire breaks into east and west. So in the east, we have the rise of the strength of Constantine, for example, and ultimately, the triumph of the East over the West. What happens in the later years of Palmyra in the breakup of the Roman Empire and I guess it’s some kind of importance to the empire, because the empire is consumed by the other, greater problems that Ken has mentioned. RAJA: That’s a large question. We’ve gone through in scholarship, these narratives about, well, the decline and fall of the Roman Empire. But when you begin to look at the broader region of the East itself, the story is quite different, because in what we then term late antiquity, in the late third, fourth, fifth, sixth centuries even, we see a lot of urban flourishing, actually. So it doesn’t seem to have been necessarily that traumatic that this break came along. Urban societies were very numerous in the east, and they were very diverse and flourishing. And they had very local strategies for how to survive. So if we look at, for example, the decapitalist[?] region, Northern Jordan today, we see that in late antiquity, the cities were really very densely inhabited, for example. Which is contrary to what we thought earlier. But what we see at Palmyra is different. So after the sack of 273 CE, not a lot happened. We know that there was a little society. But for example, sculpture was not produced anymore and trade didn’t go through the town. So this sack really was also a political Roman decision, which then led the trade around Palmyra and decided not to let caravans go through. I mean, that’s at least what we think. And that really also became an economical downfall of the city. So I think we really need to look at the local situations in late antiquity, in order to understand how this break with the West actually impacted the local urban societies. CUNO: That’s a good introduction to the sculpture that’s in the room, surrounding us. This is a sculpture that dates from just a couple of hundred years. And so what preceded it and why did it come to such a clear end? Or did it come to a clear end? CUNO: The sacking, yeah, yeah. RAJA: …of Palmyra by Aurelian and his troops. So the beginning is more difficult, in the way that just as the city seems to emerge out of the sand, the sculptural habit or the portrait habit also seems to emerge out of nowhere. I think it’s very related to a wish for monumentalizing the cityscape. So these portraits go together with the introduction of the massive tower graves, so the tower tombs, which could hold up to, some of them, more than 300 burials. So massive towers, in six stories, some of them, surrounding the cityscape, and definitely being identifiable by individuals as being, oh, this is the tower of Elavil[sp?] and his family. So you’re standing in the cityscape and you’re looking at your heritage. So your Palmyrene heritage, your family heritage. And as a foreigner coming to Palmyra, these towers were the first things that you would see, as well. CUNO: Were there other such towers in the region? Is this an Eastern phenomenon? RAJA: No, they are very unique to Palmyra. We have a few smaller grave towers in the region, but it was a very unique Palmyrene tradition. LAPATIN: But you also have smaller tower-like funerary structures on the streets outside of Rome. They had different forms of commemoration. And again, at Palmyra, what we see is a kind of selection, a deliberate choice of different elements from different traditions. And the earliest Palmyran reliefs—and we have some of them, generously on loan from the Ne Carlsberg Glyptotek, in Copenhagen, here at the Getty Villa—they’re very similar in typology—not in style, but in typology—to Roman funerary reliefs. And it’s perhaps an over simplification to think that with the growth of Palmyran trade networks, with greater contact with Roman, that Palmyrans in Rome would’ve seen things like this and then decided they wanted similar things. And I don’t mean to be reductive, but I think there’s an element of emulation, as well as, clearly, invention. And these quickly become distinctively Palmyran, to serve Palmyra reliefs. But it’s hard to think that the format would have come into being without the contact with Rome. Am I right, Rubina? RAJA: Yes. No, I think that’s very well put. CUNO: Yeah. Well, we’re standing in front of one such relief of a male and female—let’s say husband and wife—and they’re identified by an inscription. And they would’ve been on the face of one of these graves, as it were, within the great vertical tower tomb, as you’ve described it. Describe how that works, exactly, because I know that these would be on the face of one section of the tower tomb. The mummified body would’ve been deposited behind this. If our listeners can imagine a kind of drawer or a kind of cabinet and on the face of the cabinet are the images of the figures whose remains lie within the cabinet. RAJA: Yes, they are. They— these are the so-called loculus reliefs. And loculus means niche. And you very rightly described it as it was. So there were these rows and rows of empty shelves in the graves. And when people died, they would be assigned a shelf. Or maybe it was assigned already before they died; we don’t know. The body was mummified, put onto the shelf, and a portrait, either of the individual or the individual together with family members, would be placed in front of the shelf and seal off the burial niche. So they were never meant to be opened again. But what we interestingly know about Palmyrene funerary practice is that, for example, a couple of generations later, a family father could decide to sell off fifty burials, and let somebody take them out and put up new portraits and new burials. So there was also sort of a pragmatism around these things. While, on the one hand, the inscriptions really tell us about the family and the father’s father and the father’s father’s father and so on and so forth— Sometimes they mention up to five generations back in time. RAJA: It’s old, and as long as you pay me, it’s okay. CUNO: Right, right. Well, describe this one, and what it tells us about the Palmyran sculptural tradition, but also what the inscription tells us about these particular individuals. LAPATIN: Well, the inscription tells us that here we have “Atenatan, the son of Bola. Alas! Shalmat, his wife. Alas! Yahay, their son, made (this).” So here we have three generations of a family recorded, and we have the husband and wife. They’re depicted from about the waist up. Both are wearing voluminous draped garments. The man has shortly-cropped hair, the man Atenatan. The hair is falling in comma-like locks, as we see in Roman portraits of this period. We’re in the early second century of the Common Era. He has a furrowed brow, and even furrowed cheeks, so although his face idealized, he’s given attributes of age. One of his hands is— arms is slung in his garment, like Greek and Roman philosophers. And his other hand holds what seems to be a scroll or document. And this is very typical. Next to him, his wife. She has very elaborate headgear and some jewelry, which is typical of Palmyran woman. And as time progresses, we can see a change, with more elaborate hairstyles, much more jewelry. This can be related to the growing prosperity of the city, but also fashion. The early reliefs, the women often hold positive feminine attributes. She holds the spindle and distaff. Weaving was something that women throughout the ancient world did, in Greece, in Rome, and in the East. She also has an elaborate brooch. But most elaborate are her cluster earrings. They look like grape clusters. They may well have been pearls. Palmyra, as we said earlier, was a center of trade across the desert, but also through the Red Sea, of gems and pearls. She wears a kind of veil, a twisted turban and a diadem. And these would’ve all been painted. And we have examples in the exhibition, both with carved patterns, like the relief just next door, which is just a woman named Ala, who looks a lot like Shalmat. She’s wearing similar drapery, she holds the spindle and distaff, the cluster earrings. She’s more finely carved. 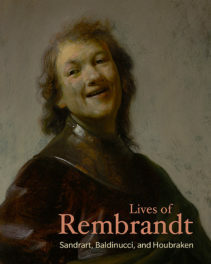 But some of the later portraits in the exhibition have much, much more drapery and preserve color, which is quite rare. CUNO: Yeah, we’ll get to that color in a second, because that’s so important here in these Palmyran reliefs. But help us understand. Are these commissioned in the lifetime of the individuals, or are they commissioned by their survivors? RAJA: We don’t know. That’s the short answer. Since this double relief, the inscription lets us know it’s the son who had this made, there seems to be an indication that this was done after the parents were deceased. But it’s very likely that people would have been part of choosing their image, as well. I mean, we know that in other societies of that age, also. There seems to be, as we can also see on the sizes of these single reliefs, some systematic to them. So they could partly have been pre-produced, as well, so that you would just go in and have them sort of optimized to fit your mother or your daughters or your grandmothers’ image, as well. Because although they, on first hand, look very similar, they are all highly individualized through the inscription and through the details of the portraits itself. LAPATIN: The inscriptions, some of them are very, very poignant, as are some of the images, especially when we have children who have predeceased their parents, which is a tragedy in any society. And one of the reliefs here has a mother mourning her daughter, with her arm around the daughter. And the mother has bared her breasts and she’s scratched herself in mourning. And those wounds would’ve been picked out in color. Several of the reliefs are of children, who wear slightly different dress. Their heads are often uncovered. They’re often holding birds, which in the Greco-Roman tradition, are sometimes thought as attributes or symbols of the soul; but they were also kept as pets. And of course, the death of children is unexpected, and these probably would’ve been commissioned, you know, by parents, and the children themselves would not have had a role in their production. CUNO: Now, you mentioned about the paint, that these were originally painted. And in some cases, some of that paint survives. And we’re standing in front of one now, nicknamed The Beauty of Palmyra, because she’s draped with jewelry. And that paint still survives, in some diminished form, on much of this jewelry. How much of this would’ve painted, and how many colors would’ve been painted on this? RAJA: Well, what it seems like is that these busts were polychrome—so multicolored—but that they were only partially painted, so that a piece wouldn’t have been completely covered in different sorts of paints, but highlights would have been done. We’re standing in front of The Beauty of Palmyra, which is one of the core pieces in the Ny Carlsberg Glyptotek collection. And on this sculpture, there’s a lot of traces of paint left. So we actually see different shading of gold, and that is leaf gold of different kinds. Some are darker, some are lighter. We see red paint, we see black paint on the hair, we see even rosy cheeks, so red paint on the cheeks and on the lips, as well. There is also blue coloring in places on this sculpture still. But what we also know, because we know when this was found—it was found in 1928, by the Danish archaeologist Hal Inghalt[sp?]. And he describes how vivid the colors were. Then he purchased it, had it sent to Beirut, had it shipped to Copenhagen. And when it arrived in Copenhagen, he was shocked about how much it had faded. So we really have to imagine that now these colors on the Beauty looks like pastel-y and vague. CUNO: Well, why would it have faded so rapidly? RAJA: Well, these things were inside graves for thousands of years. And when they’re exposed to sunlight, they really fade. And the colors were usually plant-based. And that means that they can peel off quite easily. LAPATIN: And one aspect that is lost, but is evident, is there were also additions in other materials. Her eyes are carved more deeply because they were inset with probably colored stones, or maybe glass. She’s wearing three different rings that were also inset for colors to be put. Her brooch, her necklace, her headband, all have cavities that would have been filled with inlays. So there was also color added through the addition of different materials, as well as paint. On the relief just adjacent, of a young woman named Batti, the daughter of Yarhay, she has perhaps not as much jewelry as the Beauty, but she’s wearing elaborate textiles, whose patterns have been carved. And these are running spirals and floral festoons and zig-zags and checkerboards, as well as twisted bracelets and necklaces. And these details would’ve all been picked out in paint. And it’s fascinating that because of the dry climate of the desert, some fragments of ancient textiles— And of course, textiles, being lightweight, high-labor, high-value, were things that were worth carrying across the desert, like spices and pearls. Fragments of surviving textiles from Palmyra preserve exactly these same patterns. 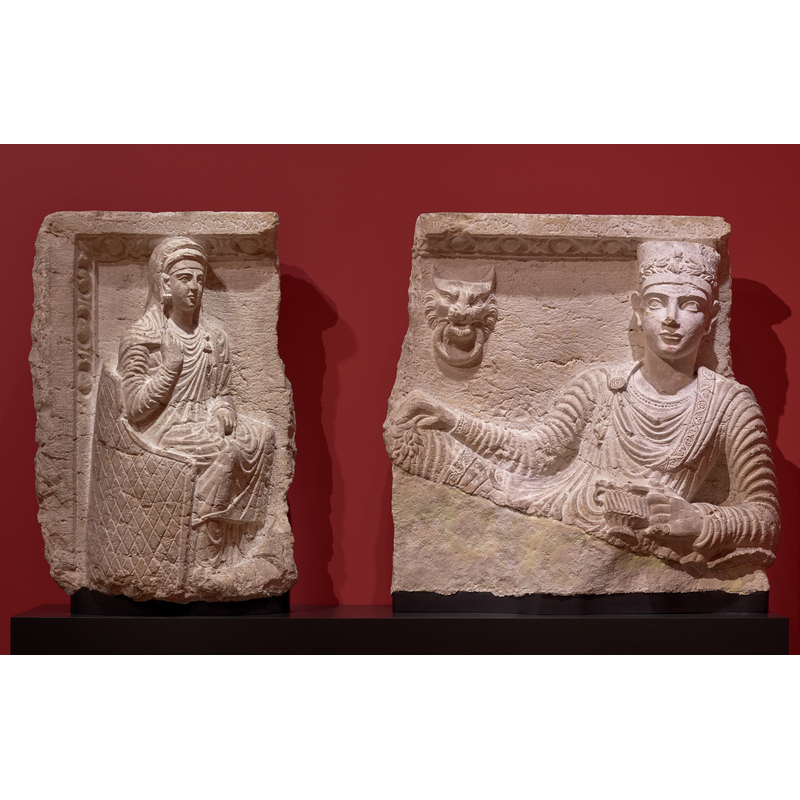 So although there’s choices, there’s idealism, these reliefs aren’t photographic, they’re important evidence, testimony to the largely lost riches in textiles that made Palmyra so important, and were important throughout the Mediterranean world, as well. CUNO: Now, all of the sculptures that we’ve been looking at and you’ve been talking about are bust portraits, individual figures, sometimes pairs of figures. But we’re now in front of one that is more of a narrative relief, it seems, which is a reclining figure and a seated figure. Tell us about this, and what distinguishes this sculpture from the previous ones we’ve been talking about? RAJA: Well, this is one of the banqueting reliefs, so to say. It shows, in this case, a reclining male, a Palmyrene priest, signified by his Palmyrene priestly hat, which is round and flat on the top. And he’s wearing banqueting clothes, so to say, Parthian, very decorated tunic underneath, with a pearl border, so to say. And then he has a cloak on top of that. And you just— It’s quite fragmented, but you see sort of the beginning of his very large, wavy, Parthian banqueting trousers. And at the end of the kline, so the banqueting couch, his wife is sitting. So a female is sitting in a basket, what seems to be a basket chair. And she is holding her veil with one hand, so her hair is covered, as was the custom for Palmyrene women, as well. She’s wearing a headband, then a turban, and then a veil on top of that turban, which she pulls down over her shoulder. And she holds her large cloak in front of her thighs, as well. And then she has yet another dress garment covering her until her feet, as well. LAPATIN: She’s really effectively a full-length version of the other women we saw in the bust portraits. She has the cluster earrings, she has the veil, the turban, the diadem with patterns. She’s wearing the trapezoidal brooch with rosette. So this seems to be the standard formalwear of the Palmyran women in this period. We’ve gone back a little earlier than the Beauty, who was bedecked with jewelry. She’s more of the modest woman type, the good wife, housewife, and keeper of the home. But we see her from head to toe, not just cut off at the waist. CUNO: This is a more or less narrative scene, or one can determine a narrative from this. The others are more iconic portrait busts. So what’s the function of this one? RAJA: The function of this would basically have been the same as the other ones. This would have been put up in a grave, either in front of a large grave niche or in a niche next to the burial. So there’re different ways of putting these up. This could also have been placed centrally in a grave niche, because this could have been the founder of that niche, so to say. We don’t know where this was found, exactly, so we can’t really place it into its original context. But these, based on others, these are the functions that it could have had. So it would have been a commemorative portrait, also, commemorating Malku, the priest Malku and his wife. CUNO: So we have mentioned two different kinds of sculptures, but there’s a third kind represented in this gallery. And these are the heads of figures. And we saw in the photomural, how these might have been put on great columns. Describe these heads to us, so that— Describe their function or how one would have seen them and what they would’ve represented to the Palmyran walking through the great street of the center of the city. RAJA: Yes. Well, as we see on the main colonnades, there were all these consoles halfway up on the columns. And we also know that statues could’ve stood on bases along the streets. And the head we are standing in front is a head depicting a man from Palmyra. And it’s very high artistic quality. The craftsmanship is really exquisite. So it’s cut off at the bottom of the neck, basically, but would have belonged to a life size, or even slightly over life size male statue. He’s bearded. The beard is extremely detailed. I mean, the locks in the beard are extremely detailed. His lips are small. His nose is fragmented, but one can see that it was very nicely carved. He has deeply set eyes, which are surrounded by his— well, his upper and lower eyelashes. You can even see those were carved. His eyebrows are very distinctively carved. And he has small wrinkles in his upper front head[? ], to give him a more stern sort of expression. And then he has nice curly hair, arranged also in locks that goes towards the middle of his forehead. And then he’s wearing a wreath. And in that— that wreath is a floral wreath. And centrally on that is placed a bust, which is fragmented, but must have been a young male person, because we know that on some male wreaths and the priestly hats, either a Palmyrene priest was placed or a bust of a youngish person. And if we imagine this with colors on it, as well, and restore it to the size that it would have had—two meters or a bit more than that—that would’ve been a very impressive, expressive portrait of an elite Palmyrene male member. LAPATIN: We don’t know who he is. We’ve lost his body. But we’ve also lost the inscription that went with him that would tell us who he is, who his parents were, members of his family, and why he was deserving of a portrait. What had he done for the city? Had he endowed a building? Had he made a great contribution? Had he contributed to the defense of the city or the education of orphans or built a temple? All of these things would bring status to an individual for benefices done to the community. And we know this from the inscriptions that survive without the statue. Here, we have the statue without the inscription, so we don’t know exactly what he did. But we know the type of thing he did. Also, if we walk around the back of the statue and look at the top, we can see that they’re very coarsely carved and unfinished, because they wouldn’t have been visible. This would’ve been placed at a certain height, and it was really the front and sides that mattered. But it’s a very powerful and expressive image. Its choices are made stylistically. The furrows in the brow are very prominent, which show that he was thoughtful, working hard, caring, thinking about the city. He wasn’t being presented for his youth or his beauty or his athleticism; it’s really about his efforts and accomplishment. And so as vividly realistic as these images seem, they’re also cultural constructs. They’re communicating wider cultural values. And we see that in all of the portraits here in the gallery, to varying degrees. CUNO: Now, I mentioned at the very beginning that all of these sculptures came from one collection, that is in Copenhagen, the Ny Carlsberg Glyptotek. That wasn’t exactly true, because there is one sculpture that comes from Stanford University over here, and is reunited with one in the Carlsberg Glyptotek in Copenhagen. Describe this to us. And how is it that it was separated, and how you identified that they belong together. LAPATIN: Well, this is another— originally, a multi-figure relief. And it seems to have been broken up in the nineteenth century, to be sold as separate, individual reliefs, for the purposes of the art market. In the nineteenth and early twentieth century, Palmyra really was an open site, and locals and visitors were able to acquire and buy and sell reliefs. And they were brought to Damascus and Beirut and shipped to Paris, and there was a lively market. And the part of the relief on the left was purchased, it seems, by Leland Stanford, Junior, after whom Stanford University was named and founded, in the 1880s, perhaps in Rome, or maybe Paris. Whereas the figure on the right was acquired by the Glyptotek from a private collector in Beirut decades later. And these two pieces were in separate collections. And it was through the work of our colleague Fred Albertson, who’s a professor in Memphis and a former Getty Villa Scholar, who was assembling a corpus of Palmyran reliefs in the United States— Reliefs are spread throughout the world. As Rubina said, more than 3,600 are known. And Professor Albertson, looking at stylistic features, the way the drapery is carved— There’s a little hook of drapery inscribed beneath the neck that’s almost identical. The eyes are very similar, the eyebrows are similar. Although one figure is bearded and one is clean-shaven, the mouth is very similar. The position of the hands and drapery, they’re very similar. And the inscription, which is badly damaged, seems to connect the two. So Professor Albertson made the association between these two reliefs. And the young man, now on our left, is missing his right shoulder. And behind him, as on several other reliefs, there’s a swag of drapery that’s supported by a rosette and a palm. And the figure next to him has a bit of a shoulder and a big of a swag of drapery next to him. So this was another reason Professor Albertson hypothesized that they went together. And he even Photoshopped them together nicely and they seemed to join. And on the basis of his research, when we knew we were borrowing several of the reliefs from Copenhagen, we thought we could reunite these two. And we approached Stanford and they were very excited and very cooperative, and so they sent their relief down to L.A.
And when we had both reliefs here, we tried to join them together, as Professor Albertson had done in his Photoshop, lining up the missing shoulder and the missing drapery. And they wouldn’t fit together. Something was wrong. The heights didn’t match. We thought, did it go wrong? And while we were trying to figure this out, one of our conservators, on a whim, said, “Well, why don’t we flip them and change the sides?” And we did that and they joined perfectly, up to little notches where they were deliberately broken apart for the market. But that extra shoulder and that extra swag of drapery indicates [Cuno: A third] that this was a three-figure relief, [Cuno: Yeah] not a two-figure relief. The inscription names the bearded man in the center as Male. We believe the figure now on his right, in the proper position, is one of his sons. And the figure of whom we just have a bit of shoulder and drapery maybe was another of his sons, maybe was a nephew or another relation. And who knows? Maybe there was a fourth figure. We’re looking for that missing figure and we have yet to locate it. We thought we were just going to reunite the two, but we’ve discovered that there was, in fact, three. So this is a really exciting new discovery we’ve made in bringing these together for the first time in over a hundred years. CUNO: Yeah. So the rest of these, as we said, sculptures, are in the collection of the Ny Carlsberg Glyptotek in Copenhagen. Rubina, tell me how that happened, that the museum gathered all these things together and built a collection of this importance. And how important is this collection in the world of Palmyran sculptures? RAJA: Well, it is the largest collection of Palmyrene funerary sculpture outside of Syria itself. So it’s absolutely unique. And it was built by the collector himself, Carl Jacobsen, who was a brewer. And the brewery goes on until today, Carlsberg. And he collected a lot of ancient art. He also collected paintings. And he had a private museum, the Glyptotek, close to his brewery in Valby, which was right outside of Copenhagen then. Now it’s central Copenhagen. And at some point, he decided to make that collection available to the public, and had Ny Carlsberg Glyptotek built in central Copenhagen, right next to Tivoli and the Central Station. And in this process of collecting in the late nineteenth century, he also came across the Palmyrene sculpture. And he writes his agent, which was the Danish Consul Leutville[sp? ], in Beirut, that he would like to purchase a large collection of these, because he realizes that they are the best comparative material in the whole world, to Greek and Roman portraiture. So already at this point in time, he actually, quite visionary, sees that this might become very important material, so he buys a lot of these. He also bought a Palmyrene mummy—there’re not very many of these around—and had it shipped to Copenhagen. And we looked for it for quite a while when I began the project, because we thought it had been misplaced and just never been on show. But we also found the letter where it becomes clear that when it arrives in Copenhagen, that they opened the box, it simply disintegrates from the travel and the large climate change. But he bought that mummy because he wanted to preserve it for future scholars to investigate whether the portraits indeed were images of the Palmyrenes. He knew that that wasn’t possible in the late nineteenth century, but he hoped that in the future, it would be possible. And this is, of course, what people are doing today now, with 3-D scanning and all these sorts of things, trying to reconstruct how people looked in the ancient world. So he was very visionary in his way of collecting in that way, and that’s the way that the collection came into being. CUNO: Well, we’re deeply grateful to the museum for lending so many of its extraordinary things to us for the installation of this exhibition. Ken, why this exhibition now? 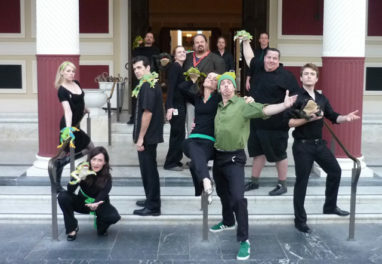 Why at the Getty Villa? LAPATIN: Well, I think there are a number of reasons. I think globally, first and foremost, we have to really think about our cultural heritage and the threats it faces. And with the tragic and recent attacks on the city of Palmyra itself, as well as other archaeological sites in the Middle East, in zones of conflict or civil war, the preservation of our cultural heritage is of the highest importance. And the title of the show, Loss and Remembrance, is both about the ancient Palmyrans trying to commemorate their dead, but also the fact that we need to preserve cultural heritage globally. But this gallery is also part of a new initiative here at the Getty Villa, looking at the broader context, in the ancient world, of the Classical world. Our permanent collections are largely Greek, Roman, and Etruscan. They’re ancient Mediterranean. But of course, these ancient cultures didn’t live in isolation. They were in contact much more broadly with the Persians, with the Parthians, with the Egyptians, with Northern Europe. And as part of a larger Getty initiative, the Classical World in Context, which is about to expand even more, we’ve dedicated one gallery to changing exhibitions of long term loans, focusing on other ancient cultures with which the Greeks and Romans had contact. And so Palmyra offered the perfect opportunity to inaugurate this series. Through our previous contacts with the Glyptotek, they’ve been incredibly generous in lending this material, which was temporarily off show in Copenhagen, so available to us as they’re preparing their own reinstallation of their show. And we’ve been able to remount all of the sculptures as a help to them and something we often do with collective loan exhibition projects. So it’s a great way to launch this project. Finally, it’s a project that has gotten a big push and assistance from our colleagues at the Getty Research Institute, which just two or three years ago, was able to purchase the earliest surviving photographs of Palmyra, from the 1860s, made by a French naval officer. And these were part of an online exhibition our colleagues at the GRI mounted, along with several of the rare books full of early engravings that were so influential. And that’s on an online exhibition that the Research Institute has produced. But we have some of that material, for the first time, on display—the photographs and a few of the rare books—in the foyer of the exhibition. So there are several aspects that make this kind of the perfect storm of exhibition, the key one being somewhat tragic, with the destruction of the site recently. CUNO: Well, it is a very beautiful and poignant exhibition. So Ken, thank you very much for the exhibition. Thank you for your participation in this podcast this morning. And Rubina, it’s a great delight to have you here with us in Los Angeles and to participate in this podcast, so thank you very much. LAPATIN: Thank you, Jim. Thank you so much.